VATICAN CITY (CNS) — Ankara and Istanbul were gray and cold, at least compared to Rome, during Pope Francis’ Nov. 28-30 visit to Turkey. And the general reception, outside of the pope’s official meetings, was hardly warmer. There were none of the enthusiastic crowds that usually greet him on his trips, no masses waving signs of welcome along his motorcade route or behind police barriers at the stops. Pope Francis, who seems to thrive on contact with the public, especially with the young, the aged and the infirm, seemed dispirited by the lack of it this time. Despite his relatively light schedule — six speeches over three days, compared to 14 during his three-day visit to the Holy Land in May — he looked attentive but increasingly weary at his public appearances. There was an obvious reason, unrelated to the pope himself, for the general indifference to his presence. An observer did not need to know that Turkey is 99.8 percent Muslim to see that both cities he visited are dotted with the domes and minarets of countless mosques, miniature versions of the great monuments, Hagia Sofia and the Blue Mosque, that he toured in Istanbul. 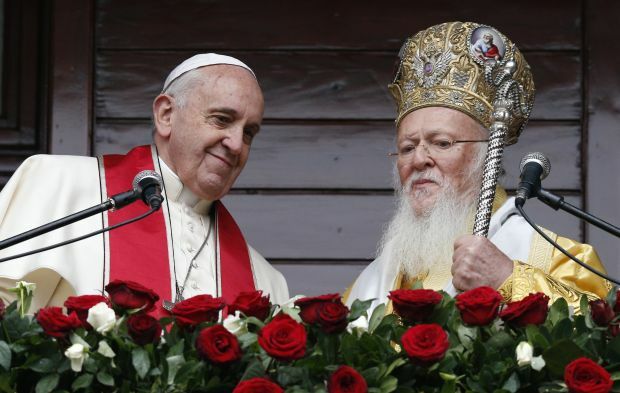 Even a brief experience of Christianity’s marginality in that part of world makes it easier to understand why Ecumenical Patriarch Bartholomew of Constantinople, whom Pope Francis traveled to Turkey principally to see, is the papacy’s best friend in the Orthodox Church and an eager participant in ecumenical dialogue. Although Patriarch Bartholomew is traditionally considered first among equals by Orthodox bishops, his Greek Orthodox flock in Turkey is estimated at no more than 4,000 people, fewer than in many American Catholic parishes. Turkish authorities have kept his church’s only seminary closed for more than 40 years. Just across the border, in Syria and Iraq, Christian minorities are being slaughtered or driven from their homes by militants of the Islamic State. In other words, necessity is the mother not only of invention but ecumenism, which also makes it easier to understand why Patriarch Kirill of Moscow, who leads tens of millions of Russian Orthodox and is closely allied with his nation’s government, can maintain his predecessors’ stance of refusing even to meet with the bishop of Rome. Rome obviously is a far less lonely place than Istanbul to be a Christian. But Pope Francis follows St. John Paul II and Pope Benedict XVI in recognizing that the West is, increasingly, Christian only in name. His Nov. 25 visit to the European institutions in Strasbourg, France, where he arrived to find the streets practically empty, was a recent reminder of that reality in the church’s traditional heartland. The impressions of Christian culture that the Muslim world encounters through globalization are not the work of missionaries. Leaving Turkey’s Presidency of Religious Affairs in Ankara after the pope’s visit there Nov. 28, reporters passed a luxury shopping mall decorated with lighted Christmas trees (reminding an American present that it was Black Friday in the U.S.). In response to the secularism of Europe and other wealthy societies, Pope Francis has taken a different tack than his two immediate predecessors. The current pope denounces a “throwaway” culture of abortion, euthanasia, unemployment, economic inequality and environmental pollution. But he rarely speaks of secularism, and his teaching focuses less on the failings of contemporary society and more on the church’s own shortcomings as impediments to evangelization. To see the church’s future now, the pope must look elsewhere, such as the Philippines, where in 1995 St. John Paul celebrated a single Mass in Manila with a congregation of more than 5 million. Pope Francis travels there in January.